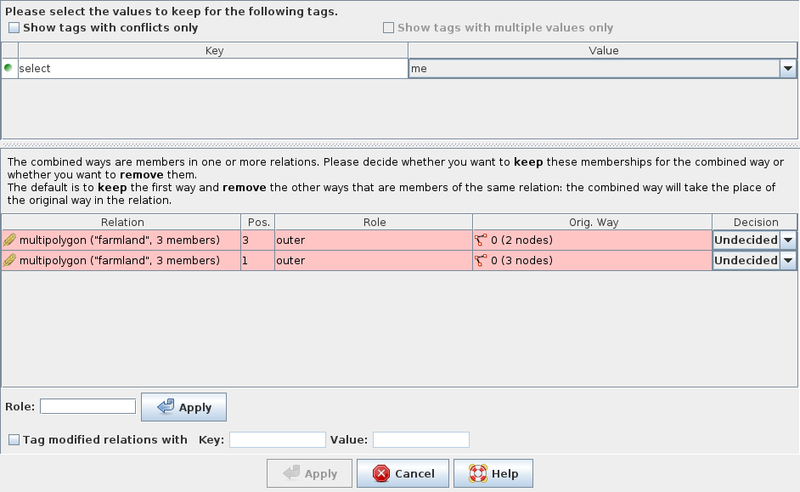 Open the attached example, select the select=me parts and merge (with C). Note how JOSM asks if we want to keep both segments in the multipolygon. Most of the time people will think "of course I want both segments" and mark them to be kept. It's not clear that he needs to keep only one way (any of them) and remove the other to have the correct solution. Since we are merging two ways into one, the decision dialog should ask us if we want to keep/remove the already merged way and not the 2 initial segments. It's even worse when we have more segments involved in the merge process. example.osm​ (1.2 KB) - added by naoliv 3 years ago.